The significance of findings in the peripheral fundus can often be overlooked. This recorded lecture, video demonstration and results analysis introduces the registrant to some of the new technology that is now available for viewing the peripheral retina. It will highlight the different peripheral retinal degenerations that we could see in practice and their significance as risk factors for developing a retinal detachment, particularly in an asymptomatic patient. 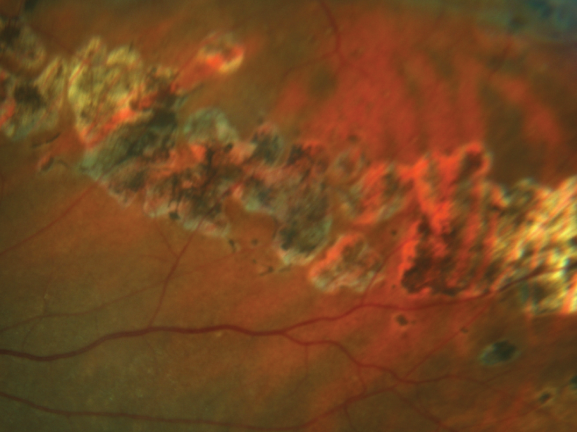 Optometrist Simon Browning reviews some of the more common peripheral retinal degenerations and how to manage them in practice. A demonstration of a patient undergoing a retinal examination using a Scanning Laser Ophthalmoscope. Optometrist Simon Browning analyses a retinal image with a patient.